“If there are teachers, there are no school buildings; if there are school buildings, there are no teachers”, said Rahmatullah Balal, Alif Ailaan’s Matiari Network Coordinator, while discussing low literacy rate in his district. Chairman, Pakistan People’s Party (PPP) Bilawal Bhutto Zardari, in connection with the World Literacy Day, made a surprise visit to SMB Fatima Jinnah Government School here on Monday. He spent the morning interacting with students, teachers and staff. Also accompanying the party Chairman were popstar and noted social worker Shazad Roy, Sindh Minister for Education Nisar Khuhro, Syed Owais Muzzaffar, MPA and Husnain Mirza, MPA Shamim Mumtaz. In a recent move in the education sector, the Sindh Government is taking many initiatives including the scholarship for 400,000 girl students for which disbursements of funds will be done through electronic means or cell phones. The more elaborate NTS testing for teachers has also been introduced along with review and rectification of various education policies. Literacy is a human right, a tool of personal empowerment and a means for social and human development. Literacy is at the heart of basic education for all, and essential for eradicating poverty, reducing child mortality, curbing population growth, achieving gender equality and ensuring sustainable development, peace and democracy. The educationists said while addressing a ceremony organized by Sindh Education Foundation (SEF) to celebrate International Literacy Day 2014 here on Monday. The theme for the Literacy Day 2014 was ‘Literacy and Sustainable Development’. Sindh Senior Minister for Education Nisar Ahmed Khuhro presided as chief guest at the occasion. He said that no country has reached sustained economic growth without achieving near universal primary education. “Schools can bring together parents, students, teachers, and government officials, offering services that support and lift up communities and families,” he observed. “Education promotes democracy and stability and builds strong communities,” he remarked. Walks, seminars and other events were held in different towns of Sindh on Monday in connection with International Literacy Day. In Hyderabad, a large number of students, teachers and NGO activists took part in a walk from the Govt Boys Naval Rai Hiranand High School No.1 to the local press club. The participants were carrying placards inscribed with slogans about the importance of literacy. They vowed to join in a struggle for the promotion of education in the country. Teachers and students of the Shah Abdul Latif University and its model school and activists of the Sindh Children Academy participated in an open dialogue on ‘How we improve literacy and education rate of Sindh’ organised by the university’s archaeology and anthropology museum to mark the day. PPP chairman Mr Bilawal Bhutto Zardari has announced that Sindh government would provide scholarships to 400,000 students across the Sindh, he spoke while visiting to SMB Fatima School, along with Senior Minister Education Mr Nisar Khuhro. He further said that scholarship would be given though mobile phone and similar schools of SMB Fatima would be established at district level throughout Sindh. He appealed to civil society organizations and educated persons to play their role for the promotion of education in Sindh. During the visit, he interacted with students and talked about the extra curriculum activities to be started in schools. Rallies for the promotion of education were conducted into different cities of Sindh including Sukkur, Larkana, Jacobabad, Kandhkot, Mithi, Jamshoro and Dadu highlighted the education of Sindh. In addition to this, different programs also conducted into many small as well as big cities and town for the promotion of education. 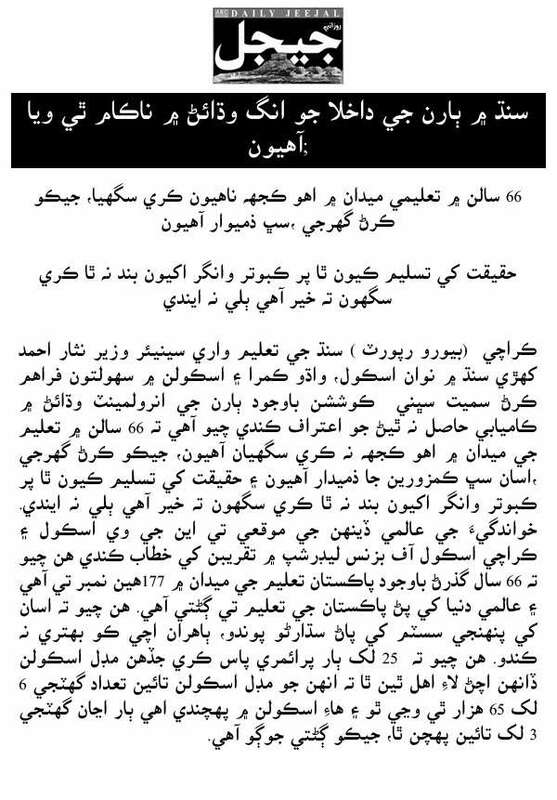 CSOs leaders and activists said even today thousands of schools are closed in Sindh. For the improvement of education merit would be adopted in education and very one need to play his/her role, if we really wish to improve the condition of education. Education minister talked while talking to the media persons in Karachi he said we could not have done for the education what we wanted to do since last 66 years. We are the responsible for this situation. Despite of taking some initiatives we are still on 177 numbers in the education. Enrollment is badly decreasing. He further said 2.5 million children are passing primary to reach middle class there the number of students are alarming decreasing reaching to 665,000 only. This number further reduced to 300,000 when it reaches to metric classes, which is an alarming situation. The students of the Bibi Assefa Dental College continued their protest for the seventh day running on Monday by boycotting classes and OPDs against the Pakistan Medical and Dental Council’s refusal to confer recognition on the college. The protesters who marched from the college building to the administration block of the Chandka Medical College criticised the management of the Shaheed Mohtarma Benazir Bhutto Medical University (SMBBMU) for being indifferent to their problem and called for immediate measures to get the college registered by the PMDC. Treasury office Qambar have stopped the salaries of 430 teachers for not giving bribe to new in charge of treasury office, teachers blamed. 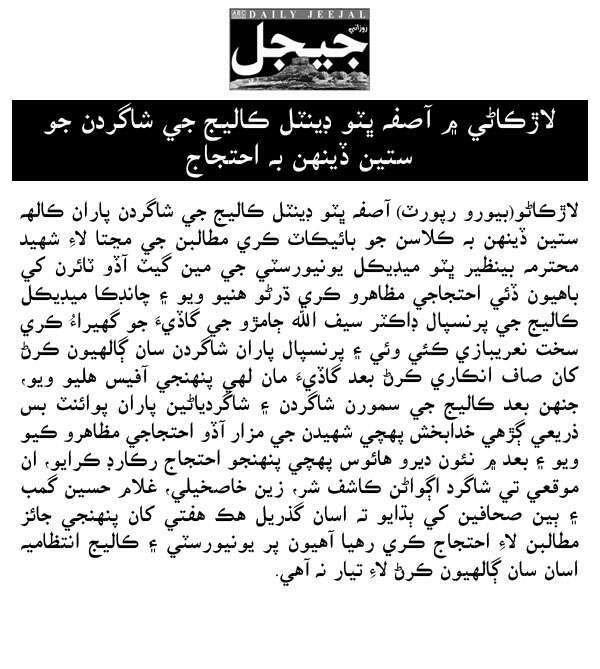 Big number of teachers and students protested against illegal action of the treasury office Qambar Shahdadkot from main primary school to Press Club Nasirabad. Representative and vice president of PT Alaf Mr Anwar Panhwar said that that injustice with teacher should be stopped and salaries of 430 should be released immediately. 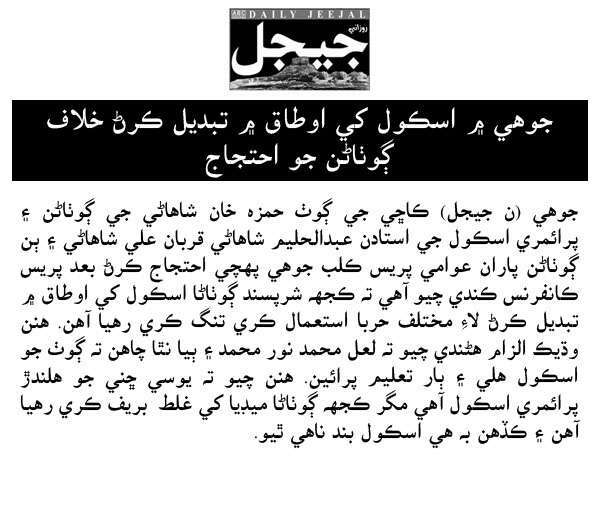 Otherwise, scope of the protest would be extended across the district Qambar Shahdadkot. Civil Society Organizations Alaf Ailaan and Thardeep conducted rally for the promotion of education at Sakhi Sarwar Town. Rally was joined by the big number of students, teachers and community members. Program Manager Thardeep Ms Nasreen Pathan said that government should take initiatives to ensure availability of teachers into hundreds of schools in district Jamshoro and should provide the missing facilities to the schools. Quoting example of the village Ali Bux Rind which is comprised on above hundred household needs school building which should be given to them, she said. Representatives of rally school demanded that government should take action against the ghost teachers and ensure the availability of teachers into schools in the area. Rally conducted under the banner of education is only tool to bring the social and economical prosperity into the society. Rally led by education officer Syed Mahfoz Ali Shah, NCHD District General Manager Ahmed Keerio, and president GASTA Rustam Nizamanai. Big numbers of people from different walks of life participated into rally. Rally aimed to promote education in the district, speakers said. They also appealed to the parents to pay proper heed to the education of their children. Rally started from Government high School and ended to court Chowk Sanghar. Rally conducted for the promotion of education from Main Urdu School to Press Club Pano Aqil. Rally was joined by the different people from all walks of life. Rally was led by ADO education female Madam Farzana Kousar, ADO education male Mr Safder Shah, and participated by many others. Rally aims to sensitize people and parents to send their children to schools so that their flower like children could get education. Mr Tamez Uddin Khero, program Director Sindh Basic Education Program said, work have been started into eight districts of Sindh. School building comprised on 15 rooms will be constructed to provide education to the children and trainings to community as well. Program will be working till to 2018 with the 90% funding of usaid and government of Sindh. Program aims to promote education in Sindh, particularly to ensure the quality education with satisfactory enrollment into high secondary and above classes. He further said that, under this program ghost teachers have no room and under this program 750,000 children will be taught English language. Administration of the schools will be handed over to Educational Management Organization which will be formed later on. Program aims to promote education in Sindh. Villagers of the village Karam Ali Lashari protested on the main road. They chanted slogans against the contractor; said contractor has left the construction work of middle school incomplete. Due to lack of school, children of the area could not get education. Villagers further said, contractor wants to do corruption that’s why he has left construction work incomplete. We appealed to the authorities to ask contractor to complete the construction so that the education could be started soon. Students protested for the registration of college and for many other issues to be resolved. They staged a sit-in in front of principal of Chanka Medical College Dr Saifullah Jamro office. During the protest one student Ms Atia Qureshi went unconscious. Protest aims to highlight the issues causing disturbance to the education and develop pressure upon the authorities to solve the issues. During the protest, Principal of the college came to the protestors assured them for the solutions of their issues after that protest was ended. School building has been cracked down from many sides. Due to lack of interest of elected persons and higher authorities no repairing has been made yet. There are 6 subject specialists are appointed here but not a single teacher is coming to teach children. Political worker demanded from the higher authority to immediately repair the building and to appoint remaining teaching staff so that education could smoothly be continued. Report revealed that there are 90 school buildings are insecure for the children which can be harmful for their life. Out of 148, 58 school building of girls’ schools are very week and can be dangerous for the children as well as teaching and not teaching staff. Report published on the day of international literacy day to highlight the issues of education in the district. Report aims to inform authority and administration so that they could take action to repairing these schools to save the lives of children. Villagers of the village Hamza Shahani, teacher and others protested against the occupation of primary school building said that some influential persons have turned primary school of the village into Otaq, causing to disturb the education of the students of the village. Villagers blamed that Mr Lal Mohammad and Mr Noor Mohammad do not want our children to get education, hence, they are getting disturbance to stop the education process in village. Protest recorded against the authorities for not paying proper attention to the primary school Walis Road Sukkur. Three weeks have passed away, but, the local administration is not taking any initiative to get sewerage water out of school causing children hardship to come to school. Students and others urged from the authority to immediately take action to get water out of school building. A survey conducted by the Institute of Social and Policy Sciences (ISPS) says there is only one teacher for every 123 students in Quetta’s Muhammad Khail Punjpai tehsil. This comes as a stark contrast when compared with the Apwa Girls School located in the heart of the provincial capital that has one teacher for every three students. “This disproportion is a major problem for us,” Ghulam Ali Baloch, Education Secretary Balochistan, told Dawn. The findings of the ISPS survey is indicative of the mismanagement and corruption coupled with extreme political interference that appear to be the underlying factors behind the poor literacy rate in Balochistan which although resource-rich remains the least developed province in the country. But while previously the provincial capital had not painted a picture so bleak, the latest ISPS survey shows that the dire straits at government-run schools in Quetta are pushing it towards illiteracy. Sohbatpur is facing Number of Educational Problems as most of the Schools don’t have any Boundary Walls, having poor Structure and lacking in Basic Facilities. With the objective of enrolling 0.7 million out-of-school children in this academic session, the Khyber-Pakhtunkhwa (K-P) Elementary and Secondary Education department launched an enrolment campaign on Monday. The day was marked worldwide as International Literacy Day. Elementary education department secretary Afzal Latif inaugurated the drive at Government Higher Secondary School No-1 Peshawar. Speaking to the media, Latif said there are 1.4 million children aged five or above who are out of school in K-P. “The aim of the government’s campaign is to get these children into public primary schools,” said Latif. Moreover, the secretary said in order to decrease the dropout rate in K-P, the government plans to bring in a public-private partnership system. Pakistan Muslim League (N) MPA Amna Sardar has said the government should take serious notice of the education system which is on the decline. Speaking at a function in Abbottabad on Monday, she said there was a mafia in the education department which had ruined it by recruiting teachers on favouritism basis. She said the teachers with low qualification were unable to teach the new syllabus in the schools. Elementary and secondary education department and National Commission for Human Development organised an awareness walk on the occasion of the International Literacy Day here on Monday with the objective to achieve the provincial government’s target of enrolling maximum number of out of school children. The walk led by district education officer Zahid Rasheed Khattak and NCHD district general manager Shafiuddin started from the Town Hall and terminated at Saddam Chowk. Teachers and students of different schools also participated in the walk, holding placards and banners inscribed with slogans highlighting importance of education. Several students were injured when two groups clashed at Government Postgraduate College Timergara on Monday. According to police, the clash erupted between the activists of Peoples Students Federation (PSF) and Islami Jamiat Tulba (IJT) that left several students injured. They said that workers of PSF staged a protest demonstration against IJT outside the college for beating members of their organisation at Government Technical College Timergara. The workers of IJT also took out a procession and activists of both the organisations exchanged harsh words, they added. Pakistan, like the rest of the world, will celebrate International Literacy Day on Monday (today). This year, the day comes at a time when Pakistan has the second highest number of out-of-school children in the world while thousands of students are out of school these days across the country owing to a military operation against terrorists in North Waziristan, floods in different parts and ongoing sit-ins at the capital resulting in closure of educational institutes across Islamabad. According to UNESCO, the theme for this year’s International Literacy Day is “Literacy and Sustainable Development.” The day is celebrated every year on September 8 across the world to highlight importance and significance of literacy. Unfortunately, Pakistan is among few countries across the world which spends quite meagre on this vital sector despite it needs the promotion of education the most. According to the policy paper, Nigeria tops the list with 8.7 million children followed by Pakistan with 5.4 million out-of-school children. The Punjab Free and Compulsory Education Ordinance is going to be introduced in the provincial assembly during the next session. The ordinance was promulgated in May and later given a 90-day extension in June. Education Minister Rana Mashhood Ahmad Khan had earlier said that the bill would be introduced in the assembly in June. Standing Committee on Education Chairman Raja Qamarul Islam says that the committee has finalised its recommendations on the bill. “With the promulgation of the ordinance, the contents of the draft bill became public,” he said. “We called for an extension because discussion on the bill was not complete,” he said. Islam said that the committee had held four meetings to discuss the bill. “Anyone who has an objection needs to hand them in writing for consideration,” he said. Provincial Minister for Excise & Taxation and Finance Mujtaba Shuja-ur-Rehman has said that terrorism and unemployment can be wiped out through promotion of quality education. He said that there is a need to utilize national resources equitably for setting up of a peaceful society and economic prosperity of the masses whereas problems like corruption, safarish and unemployment can be controlled through good governance and transparency. He said that Rs. 274 billion will be spent on education sector during the current fiscal year which is 26.25 percent of the total budget of the province. Five New Colleges for Girls and Boys are approved costing about .6bn Rupees. Minister for Planning, Development and Reforms Ahsan Iqbal said on Monday that the government would achieve the target of 100 percent enrolment of children in schools by 2017-18. This would be a step towards attaining 100 per cent literacy rate in the country, said the minister while addressing a ceremony held at Karlot Residential College in connection with International Literacy Day. The minister said that keeping in view that Pakistan is one of the few countries where a large number of eligible children are out of school, the government has announced an “education emergency” to achieve the targets set by Education for All and Millennium Development Goals (MDGs). The government has earmarked Rs 12.5 billion for education in budget for Fiscal Year 2014-15. “All children will be enrolled at schools and taught an exemplary curriculum which will make them creative and innovative,” he added. Thousands of students are still unable to resume their classes despite extension in summer vacation five times due to prolonged sit-ins that forced policemen who came from other provinces to maintain law and order situation to occupy about 28 school buildings for their stay in the capital.“The marchers should think about the nation and set aside their political agendas at a time when there are one million internally displaced persons (IDPs) and thousands others who have been affected due to flash-floods. Our children are unable to continue their studies despite the fact that the Federal Directorate of Education (FDE) extended summer vacation for record five times,” said Aaiza Malik, a resident of Sector I-9. To create awareness regarding importance of literacy among the masses, Minister of State for Capital Administration and Development (CAD) Barrister Usman Ibrahim on Monday directed CAD to establish a Literacy Cell in Federal Directorate of Education (FDE). He issued these directives at an event organised to commemorate 48th International Literacy Day at Islamabad College for Boys (ICB), G-6/3. The cell, to be headed by a director would also help decrease the drop outs rate in the federal schools and colleges and would encourage the parents to send their children to schools. Speaking on the occasion, Minister of State Barrister Usman Ibrahim said that increase in literacy rate is the first and foremost responsibility of the government towards a better Pakistan. The Pakistan Librarians Welfare Organisation (PLWO) is organising an ‘information literary awareness programme week’ from Tuesday. The PLWO secretary, Zaheer Ahmed, told Dawn that during the week education experts would hold sessions in 12 educational institutions of Rawalpindi and Islamabad to create awareness about literature among students. “The main aim of our campaign is to develop the reading habit among the students.” He said on September 13, the closing session would be organised at the National Book Foundation, Islamabad, to share the outcomes of the programme. Suspected militants blew up a government girls’ primary school in the border area in Nawagai tehsil early on Monday, officials and local people said. They said that the incident took place in Kamangra locality, 33 kilometers northwest of Khar. They added that a group of unidentified miscreants entered the newly reconstructed building of the school and planted a number of explosive devices in it. The local people said the explosives went off with a bang, razing the building to ground, but fortunately no one was hurt as the building was empty when the blast struck. In order to bring revolutionary changes in the lives of tribal folk and ensure the socio-economic uplift of the guardians of geographical frontiers, the Fata ADP 2014-15, that carries a total outlay of Rs 19 billion having a foreign aid component of Rs1.9 billion, mainly focuses on improving education, health, communication network and livelihood. This is in line with the Khyber Pakhtunkhwa Governor Sardar Mehtab Ahmad Khan’s determination to put the Federally Administered Tribal Areas on the track of speedy development. The development schemes for Fata have been pitched at 941 for 2014-15 with enhanced allocation for the ongoing schemes leading to expeditious completion. There are Rs1.7 billion funds for the Fata Development Authority, which works in six sectors.